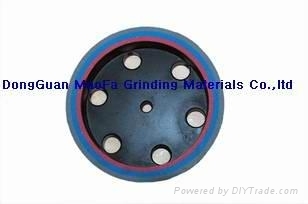 Features： 1、 It is used for shape-bevelling machine 2、 The wheels are made of high quality diamond materials and adhesives by adopting thermal processing, introducing in advanced equipment and technology, it is used for fine grinding which suits for domestic and imported straight-line edging machine, bevelling machine, double edging machine and shape grinding machine. 3、 Our products have a leading quality level compared with other producers in this line, and some series have matched similar ones abroad. Moreover, we have exported our products to many countries and regions. 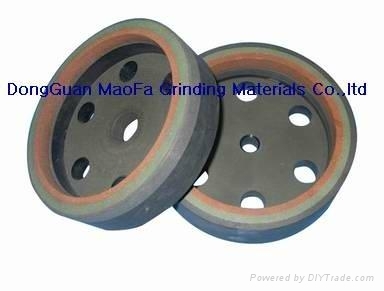 4、 Resin diamond grinding wheels for intensive processing of glasses of all specifications are widely used glass straight line double edging machine ,glass straight line beveling machine, glass straight line edging machine ,irregular glass grinding machines, and so on .they are made from different materials and with different processing methods according to the requirements of process various glasses. these products are of high performance and price ratio for its tartness, polisher easiness, and long service life.